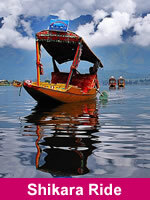 Srinagar is one of several places that have been called the "Venice of the East" or the "Kashmiri Venice" Lakes around the city include Dal Lake – noted for its houseboats – and Nigeen Lake. Apart from Dal lake and Nigeen lake city is also famous for wular lake and manasbal lake to the north of srinagar. Wular lake is one of the largest fresh water lakes in Asia. 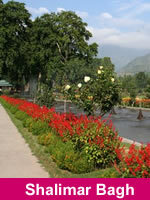 Srinagar has some Mughal gardens, forming a part of those laid by the Mughal emperors across the Indian subcontinent. 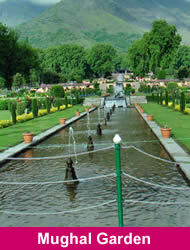 Those of Srinagar and its close vicinity include Chashma Shahi (the royal fountains); Pari Mahal (the palace of the fairies); Nishat Bagh (the garden of spring); Shalimar Bagh; the Naseem Bagh. 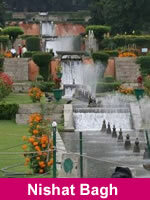 Jawaharlal Nehru Memorial Botanical Garden is a botanical garden in the city, set up in 1969. 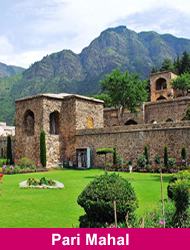 The Indian government has included these gardens under "Mughal Gardens of Jammu and Kashmir" in the tentative list for sites to be included in world Heritage sites. The Sher Garhi Palace houses administrative buildings from the state government. Another palace of the Maharajas, the Gulab Bhavan, has now become the Lalit Grand Palace hotel. The Shankaracharya Temple on the hill top in the middle of the city, besides the Kheer Bhawani Temple are important hindu temples in the city. 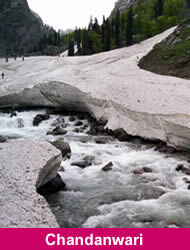 Gulmarg is one of the beautiful place that can be visited in Kashmir valley. 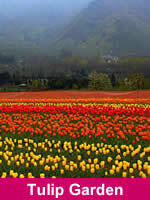 Gulmarg literally means the meadow of flowers. 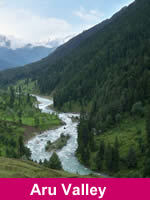 Originally, Gulmarg was called Gaurimarg, named after Shiva’s coasts. Gulmarg’s legendary beauty,prime location and proximity to Srinagar make it one of the premier hill resort in the country. 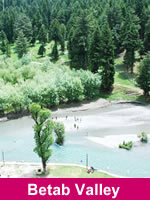 Gulmarg, the hill resort is located only 52 km. to the south west of Srinagar in the Baramulla district of Jammu and Kashmir. Gulmarg is situated at an altitude of 2730 meters above sea level and has a gently sloping topography. Its present name ‘Gulmarg’ was given in the 16th century by Sultan Yusuf Shah, who was inspired by the sight of its grassy slopes filled with wild flowers. Gulmarg was a favourite haunt of Emperor Jehangir who once collected 21 different varieties of flowers from here. 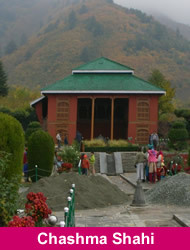 During the colonial rule over India, the British discovered the hill resort of Gulmarg in 1927. Gulmarg also hosted the British Resident and his fellow Europeans. 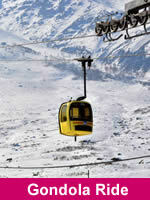 Gulmarg attracts various tourists due to its natural beauty. The snow-clad peaks and the lovely landscapes of Gulmarg have provided background for several Bollywood ventures. Today Gulmarg is not merely a hill resort – but it also has the highest green golf course in the world, at an altitude of 2,650 m and also the Asia’s only heli-skiing resort in the winter. 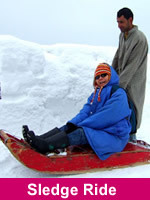 There is immense beauty and various adventure activities that make Gulmarg more than a cool hill resort. It is a convenient base for trek to the Himalayas and also offers various winter sports facilities to the tourists. 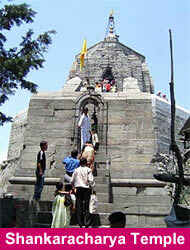 Pahalgam is also associated with the annual Amarnath Yatra. 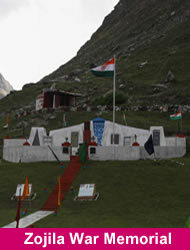 Chandanwari (2,895 m), 16 km from Pahalgam, is the starting point of the yatra that takes place every year in the month of Sawan (July to August). The road from Pahalgam to Chandanwari is on fairly flat terrain and can be undertaken by car. From Chandanwari onwards the track becomes much steeper, and is accessible on foot or by pony. About 11 km from Chandanwari is the mountain lake of Sheshnag (3,574 m), after which, 13 km away is the last stop, Panchtarni. The Amarnath cave is 6 km from there. During the month of Sawan, an ice stalagmite forms a natural Shivling in the Amarnath cave. 112 kms from Jammu. This famous hill resort is perched on a beautiful plateau, at an altitude of 2024 metres across which the Jammu-Srinagar Highway passes. Enveloped by thickly wooded forests, Patnitop offers beautiful picnic spots, peaceful walks and breathtaking views of the mountainscape of the Chenab basin. In winter, the resort is generally covered with a thick mantle of snow thus providing opportunities for various snow games including skiing. It is the best developed tourist spot of Jammu and is second to none in its natural charm, climate, pine forests and lush green cover. The occupancy of the huts and Dak Banglow is full in summer months. Vaishno Devi, also known as Mata Rani and Vaishnavi, is a manifestation of the Hindu Mother Goddess or Durga. The words "maa" and "mata" are commonly used in India for "mother", and thus are often used in connection with Vaishno Devi. Vaishno Devi Mandir (वैष्णोदेवी मन्दिर) is a Hindu temple dedicated to the Hindu Goddess, located at the Trikuta Mountains within the Indian state of Jammu and Kashmir.